Incepted in 2012, we “Precise Gauging & Automation Technology” are a leading enterprise, affianced in the production of Gauging & Automation Solutions. We Manufacture, Export various types of various types of products like Air Gauges Unit, Electronic Multigauging System, Electronic Contact Gauge, Mechanical Gauge, Production Counter Display, Electronic Display Unit, SPC Software and Checking Gauge Gear etc. Strategically located at Pune (Maharashtra, India), we are catering to a wide client base spread across the country. Our success in this arena can be attributed to the presence of a state-of-the-art infrastructure and a team of proficient and competent professionals who work with the objective of client satisfaction. Our professionals are working in a coordination to serve our clients better. We are always open to the suggestions and ideas are given by the clients to improve the quality of our product. Our offered products find wide application in various mechanical, automotive and Engineering industry. Our infrastructure enables us to produce these excellent quality products. We endeavour to maintain our commitment to quality as we utilize contemporary technology to meet the ever-increasing needs of our clients. We have come up with some of the most sophisticated Gauging Solutions in the industry that survives adverse weather conditions and meet future global needs for rugged, reliable, and innovative products. Our products are performance proven under the most demanding conditions. Our strength is the solid engineering experience in Metrology that gives us strength and drives us to be a total “Solution Provider”. Our Application Engineering involves detailed study and discussions - this enables us to Conceptualize, Design, and Manufacture, Implement and Support Gauging solutions & automation needs from simple gauges to advanced gauging systems. Our aim is to provide our Customers with the solutions they need to enhance their product Quality and Productivity and achieve their ultimate goal. 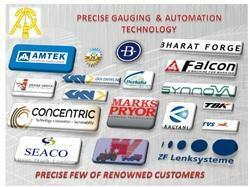 PGAT has a unique distinction having a large experience in Gauging & Automation Engineering all under one roof. This is due to its over 200 man-years of Gauging & Automation experience, giving an unparalleled advantage of achieving complete success on the assignments taken. Owing to our excellent quality guidelines and well framed business policies, we have carved a niche in this industry. We put prolonged efforts towards making amiable and close associations with all our clients. As a quality-centric organization, we strive hard to maintain quality in our complete product range. Products offered by us are manufactured by our highly experienced professionals using supreme class raw material and sophisticated technology to ensure quality and flawlessness. In addition to this, to make flawlessness in our offered products, quality controllers of our team rigorously inspect against durability, strength, corrosion resistance, etc. Quality has been consistently helping us in maintaining top most position in the industry. Our customers are bharat forge ltd, amtek auto ltd, concentric pumps ltd, tbk india ltd, falcon pumps ltd, tvs motors ltd, sreenivas engineering pvt ltd, zf lenksysteme pvt ltd, gkn driveleine ltd, bhavani industries pvt ltd, bhosale industries.